The loss of a child is one of those traumatic catalysts which, though it makes for good dramatic fodder, is horrific enough to frighten audiences away from any movies dealing with the situation. But in the right, sensitive hands, such as Robert Redford's in Ordinary People and now, John Cameron Mitchell's in Rabbit Hole, it can also trigger insightful performances which encourage a persuasive identification. Transitioning into the mainstream after directing two somewhat outrageous indie ventures (Shortbus, Hedwig and the Angry Inch), Mitchell has found the right material to delve into. Based on David Lindsay-Abaire's Pulitzer Prize-winning play, Rabbit Hole looks at the tenuous marriage between grieving parents Becca (Nicole Kidman) and Howie (Aaron Eckhart). The film begins 8 months after the death of their 4-year-old son, Danny, and finds each of the two reacting in opposite ways: Becca flatly sleepwalking through her day-to-day routine trying to put the loss behind her; Howie retreating to their den at night to watch home movies of their child. 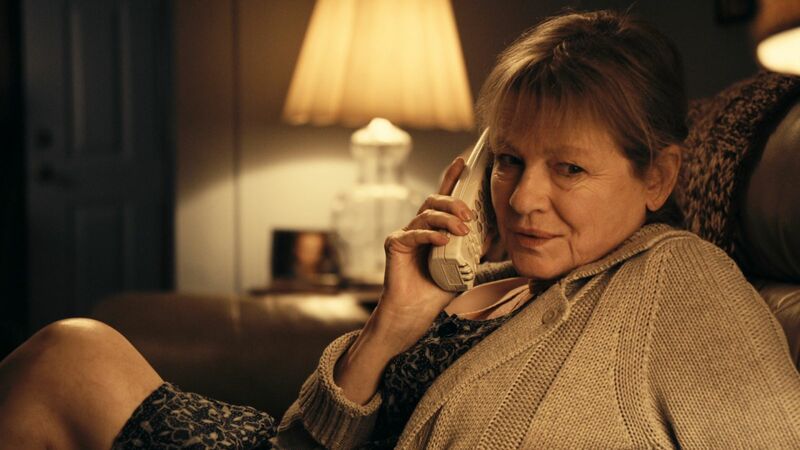 The commonplace is now re-contextualized—whether it's the new pregnancy of Becca's irresponsible younger sister, Izzy (Tammy Blanchard), the offer of solace by their mother Nat (Dianne Wiest) due to her kinship in loss (she also lost her son, albeit as an adult to a drug overdose), or deciding if and when to invite Howie's co-worker (Jon Tenney) over to a cookout since his wife has avoided Becca since Danny's death—all are viewed through the prism of the couple's grief. Looking for comfort in strange places, Howie starts spending time with another grieving parent (Sandra Oh) whose husband has just left her, while Becca commiserates with the high-schooler (Miles Teller) who drove the car that killed Danny when he inadvertently ran out into the street. Rabbit Hole sounds maudlin on paper to be sure, but the best thing about Lindsay-Abaire's screenplay is its decision to explore this tragedy from a positive, nuanced perpective. No, it doesn't call attention to itself seeking approbation for its avoidance of histrionics. Rabbit Hole simply dwells above such things by the deliberate choice of setting its story 8 months down the road, a curious crossroads where the death of a child still feels devastatingly fresh but one would feel the urge to start looking forward... the urge and the guilt. Rabbit Hole doesn't evade the darker side of grief. In particular, Kidman's vulnerable turn is an astonishing example of an actor confronting the unflattering aspects of her role without ego. I found it reminiscent of Mary Tyler Moore's dark performance in Ordinary People as a matriarch so possessed by the anguish over losing her eldest son, she almost consciously decides to hate her surviving son. Kidman's Becca lashes out with a curious sense of entitlement at her mother, sister, and even her grieving husband, as if only she can know this specific kind of pain. Where Moore's character reserves fury for moments behind closed doors with her family, Becca unashamedly targets another grieving couple at the support group she frequents with her husband and even slaps a mother she encounters at a grocery store who refuses her pleading child a fruit roll-up. Still, Kidman is able to retain one's sympathy by balancing this fury with a deep sadness, a sense of resignation which is identifiable to anyone who has experienced the death of someone close. Mitchell's surprisingly restrained direction prompts a performance from Kidman—and indeed the rest of this ensemble—which invests Lindsay-Abaire's frank treatment of the subject with a sober rationality. Rabbit Hole never tips one way or the other into misery or naive hopefulness, For that reason, if no other, Rabbit Hole deserves to overcome audience preconceptions and be praised as one of the best films this year. Rabbit Hole opens in select theatres Friday, December 17th. It opens nationwide on January 14th. Really liked the play, so I'm looking forward to the movie. Glad to hear that it is living up to what it can be on screen and that Kidman is finally beyond some of her, um, "unique" choices of recent years. The lady can do no wrong in my opinion (now, if only she'd stop with the cosmetic surgery). I even liked her in AUSTRALIA. Hey... you've got your JONAH HEX. I can have my AUSTRALIA. i was never really sold on Nicole Kidman, but i can never turn down a good familydrama. thanks for this review! We talked a bit about this one on Twitter. I do think this one carries the best performances of the year (so far) in the Leading Lady and Supporting Male, Nicole Kidman and Aaron Eckhart are really good in this. I loved how all was so intimate, so clean, the emotions aren't exaggerated into the melodramatic, the situations are good and believable, but I can't help to think that they played this too safe. Saw it last night and am absolutely devastated. The comparison to Redford's film is apt, but I'd venture to ad IN THE BEDROOM, BRIDGE TO TERABITHIA, STONE BOY and MAN IN THE MOON to this wrenching subject. I am presenting penning my own review, but very much appreciate this one. Beyond the superlative performances, headed by Kidman, I'd make special mention of Anton Sanko piercing, yet plantive piano score which perfectly embodies the somber mood and autumnal hues. The Mohawk Memoirs: You Sound Awfully Familiar!